!! OMG, hear the new Christina Aguilera-Le Tigre collabo: “I Hate Boys” !! Together we tailored themes and specific references to her personality and image but found a ton of common ground in our aim to make upbeat danceable tracks celebrating female friendship, strength, and of course, PARTYING. 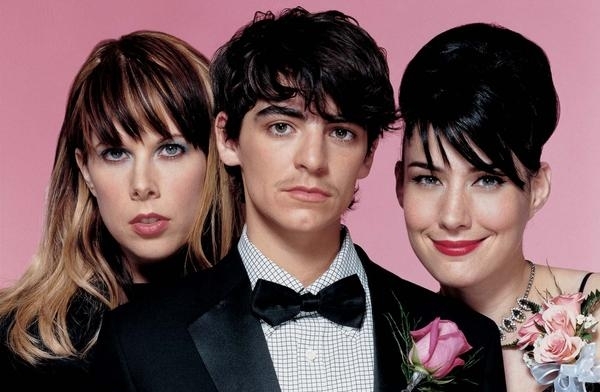 And while the giant sound of her stacked vocals and the pop sheen she lends to the tracks might seem at odds with Le Tigre’s aesthetic roots, it really works. The songs have a lot of elements we’re known for, like a garage guitar sound, schoolyard chants, new wave-y synths, electro beats, and somehow it all sounds crazily right with Christina’s unbelievable voice. I can just imagine the video now: Xtina slithering all over the jungle gym clad in a crotchless something-or-other, her hair slicked back like one of Robert Palmer’s “Addicted to Love” girls as she makes passionate love to a baloney sandwich and receives suggestive text messages from her female gym teacher on her Virgin Mobile phone. Be the first to comment on "OMG, hear the new Christina Aguilera-Le Tigre collabo: “I Hate Boys”"